This scalloped thank you tag is made from a slightly metallic gray card stock. The saying is printed on matte vinyl adhesive. 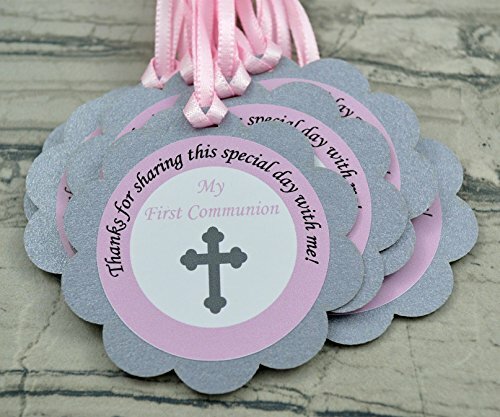 Comes with 12" of light pink satin ribbon attached for you to tie to your favor. It is a perfect send off to let your guests know how much you appreciate them. The scallops measure 2.25" and the sticker diameter is 1.75". This listing is for 12 tags. Each tag is handmade, so please allow for slight differences. If you have any questions about this product by Decorate Your Big Day, contact us by completing and submitting the form below. If you are looking for a specif part number, please include it with your message.